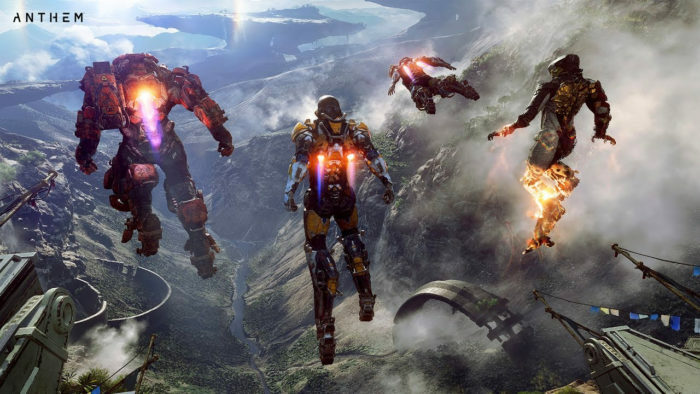 Anthem, the open-world multiplayer action game from the creators of the Mass Effect series, is slowly approaching. In a matter of weeks, everyone will be able to play this game and see for themselves what the developers at Bioware are cooking up. Like Destiny, you’ll explore “contiguous” open world areas with a fireteam. It’s all about singleplayer and co-operative multiplayer, where you’ll be able to take on high-level challenge missions with up to three friends. Right when you step into the world of Anthem, you’ll be able to select one of four ‘Javelins’, exo-suits that are analogous to classes in Destiny 2. Each Javelin suit gives you different powers and movement abilities. Played from a third-person perspective, you’ll fight an endless army of threats that surround the central hub of Fort Tarsis. It’s all about blasting bad guys with friends, earning XP, and collecting the best loot for your customizable exo-suit. Learn more about the Anthem early-access demo below, or checkout the official announcement here. Anthem will feature two limited-time beta periods in the near future. Both beta periods will give you a chance to play around with the systems, and see what this game is all about starting from Level 10. You’ll be able to earn XP and rank up to Level 15 in the two-day beta on both occasions. For playing either demo, you’ll earn a special reward in-game that shows everyone you were one of the first to play Anthem. To access the VIP Demo, you’ll need to subscribe to EA / Origin Access on PC. Or, you can pre-purchase the game on PC, PS4 or Xbox One for early VIP access. If you pre-purchase through Origin, or the PSN / XBLA marketplace, you will automatically register for the VIP Demo. If you pre-purchased through other platforms or marketplaces, you’ll need to receive a special code to unlock the VIP Demo. Bioware states that you won’t be able to retain your progress, and all beta character creation will be wiped when the beta servers are closed. Don’t expect to keep anything you’ve made or earned — it’s all getting deleted. Here’s a quick overview of everything the beta will have to offer. It isn’t the full game, so you’ll be limited to the following.